For the first time in history a Pirate Party has managed to enter a state parliament. With an estimated 9 percent of the total vote the Pirate Party exceeded the 5% floor needed to enter the Berlin parliament with several seats. For the international Pirate Party movement this is the second major success after the European elections of 2009. The German Pirate Party has scored a massive win in the elections for the Berlin state parliament today. Two hours after the voting booths closed the first results show the Pirates achieving 9 percent of the counted votes. This translates into 15 parliament seats. Founded in September 2006, the German Pirate Party has already booked several successes in its relatively short existence. Before today, the party had over 50 members in elected offices across Germany, which is more than in all other countries combined. However, today’s election win trumps all previous ones. Never before has a Pirate Party been elected into a state or federal parliament. And with the 5 percent floor that was required to enter, the achievement at the Berlin elections is all the more impressive. The initial results show that the Pirates received the most support from younger voters. 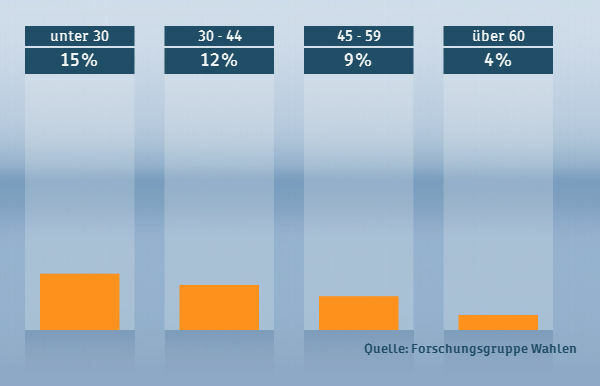 15 percent of people under 30 voted for the Pirate Party, but even among voters aged 60 years and up, a few percent voted for the Pirates. Friedrichshain-Kreuzberg was the first region to finish counting, and the Pirate Party got 14.7 percent of all votes there. With all votes counted in the state the Pirates are at 8.9 percent. TorrentFreak asked Sebastian Nerz, Chairman of the German Pirate Party, what this success means for the party. He told us that due to an increase in funds and influence the Pirate Party will have a greater chance to make its mark. “Another very important benefit is, that citizens and media are taking parties with access to the parliament much more seriously. A number of times i’ve heard, “Your party is not relevant because it does not have members of parliament.” Following this weekend’s successes, in this respect the party’s position will be greatly improved. In addition the Pirate Party expects that their heightened profile will lead to an increase in members and more people working for the party. As for the party’s ideals, they want to be as transparent as possible, secure the privacy of citizens, abolish patents and limit the ever growing control of copyright exploiting organizations. “We are going to demonstrate that it is possible to conduct a transparent approach to politics. Traditionally politics are a secret ‘no trespassing’ area. Meetings are held behind closed doors, agendas and protocols are closed, treaties are not being published,” Nerz told TorrentFreak. One thing’s for certain. 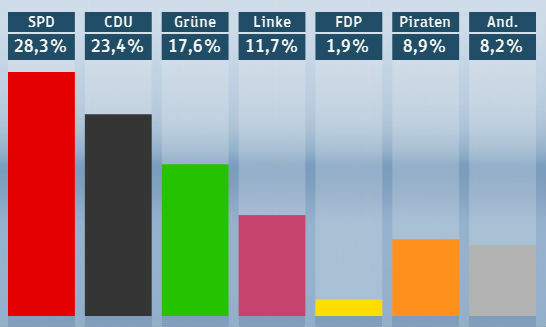 The German Pirate Party scored a sensational win today. As a result, the Berlin state parliament will undoubtedly notice the fresh wind coming from the most technology-friendly and privacy preserving party out there. All the Berlin candidates are ready and eager to start according to the chairman. “In short: We are going to demonstrate that politics can be reformed,” Nerz says. 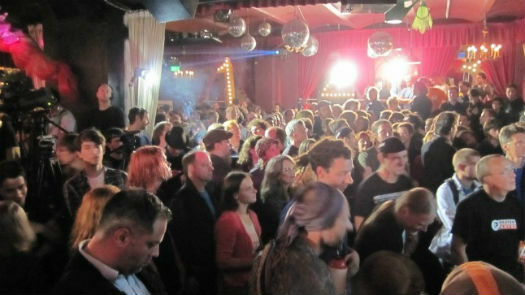 The election win is currently being celebrated by hundreds of Pirate Party enthusiasts in Berlin, including the founder of the Swedish and first Pirate Party Rick Falkvinge. Rick already predicted the massive win yesterday and shared a picture of the festivities with TorrentFreak. “Pirates of Berlin, thank you for your fantastic work in making tonight happen. We all stand shoulder to shoulder in fighting for the next generation — one of succeeding is all of us succeeding. Tomorrow, people will look to your success, and the movement will grow yet more. You are the source of inspiration for the next wave of civil liberties activists,” Falkvinge adds in a blog post.